Hello, good readers! It’s been quite a while again since I’ve posted on the blog, and I’m quite sorry for that. About two weeks ago I started having severe pains in my lower back, and was diagnosed with a cyste which was surgically removed last Friday. I’m currently recuperating at home, and sitting in a chair is becoming less and less painful as days go by. The good news is: I’m having a few weeks off so I can start getting some more painting in. The bad news is: it’s only until Crisis 2013, so all the new goodness I’ll pick up there won’t benefit from my time off. But enough banter! 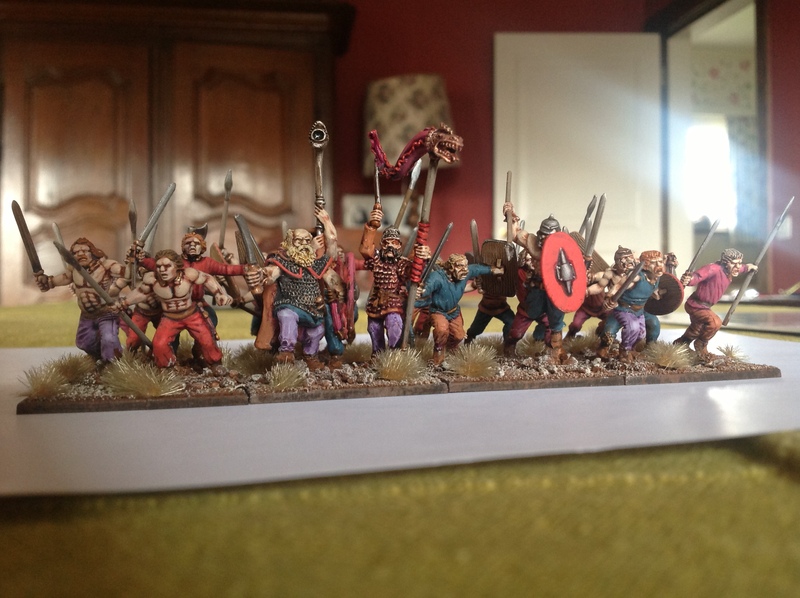 Time to finally show you those Dacians I worked on in Spain. Plastic models and a metal command group, by Warlord Games. When I arrived in Spain and sat down to paint I thought I’d packed my models, paints and brushes well, but apparently I’d left my cadian fleshtone and reikland fleshshade back in Belgium. Curses! I made do with a mix of kislev flesh, mournfang brown and a little mephiston red to basecoat the skin, and a mix of seraphim sepia and druchii violet to shade it. In the end I think it turned out alright with the subsequent kislev flesh and flayed one skin to highlight this unorthodox approach. Some very wild looking models. I took the liberty of making some minor conversions to the models; a head with a felt hat and an axe from Gripping beast plastics, and converting some of the ‘leaping forward’ poses into something more upright with a little greenstuff to the stomach area. I also managed to pick up a blister of Celt Linebreaker models (the guy with the red shield in the front rank, for example) to add some variety to the poses. Not very historically accurate, but I think they look fun. I’ve based these eight wide, four deep but with a loose order so I only need 24 models. I’m aiming for a four-strong division of Dacians for Hail Caesar with one more regular warband, a falx warband and a unit of nobles. 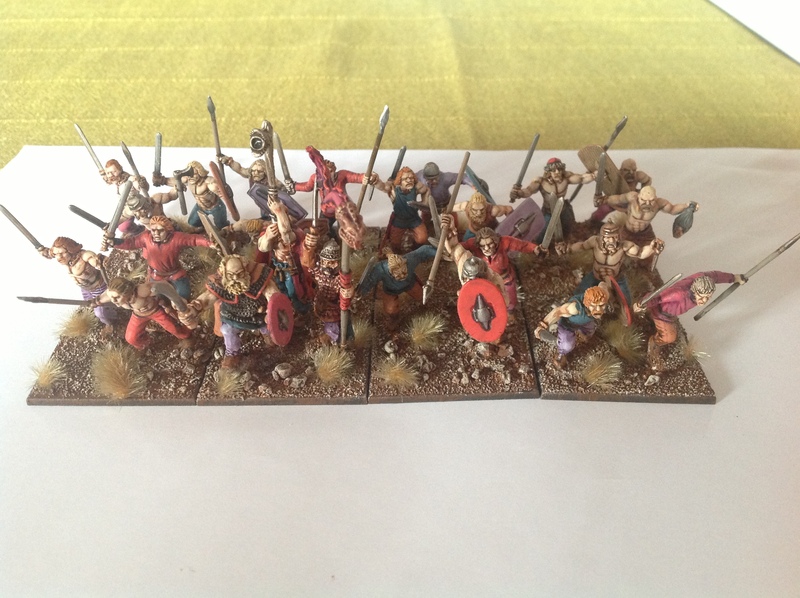 Later on I might add some skirmishers, too. As well as these plans, there’s also Impetvs which is played with much smaller units – so I might be trying that out sooner. We’ll see! 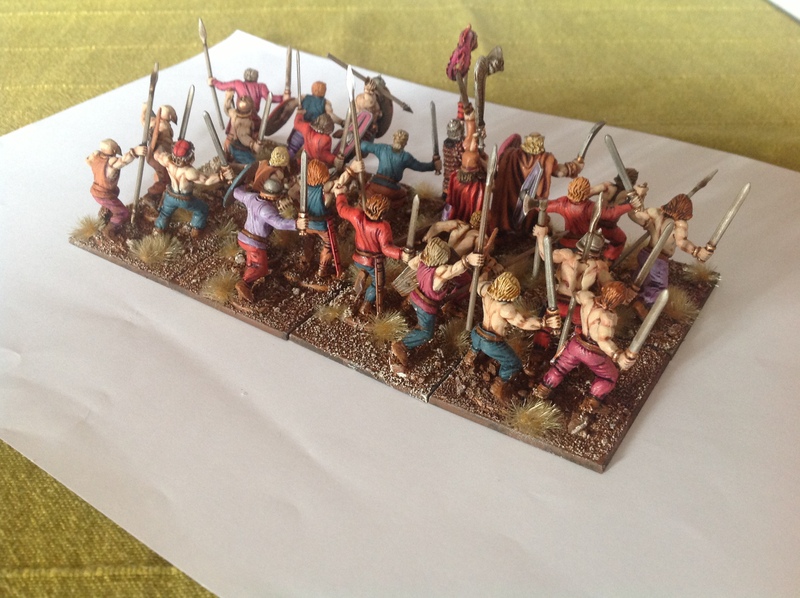 In other news, I’m currently basing my recently finished Hollandish pike company and a small batch of Viking archers, and I’ll be painting Captain Charles Upham VC & bar as a one-off before tackling a larger batch. My girlfriend is fetching some new paint pots for me so I can continue work on them – how lucky I am!